Hasbrouch, Wilbert R.;Hasbrouck, Wilbert R.
In the late nineteenth century, Chicago -- the birthplace of modern architecture in the United States -- was a magnet for aspiring architects. The city was forced to rebuild after the destruction wrought by the Great Fire of 1871 and also to expand to accommodate a surge in the population. The seemingly endless demand for taller and more sophisticated buildings offered young draftsmen an unprecedented opportunity to influence the design of the American skyscraper. 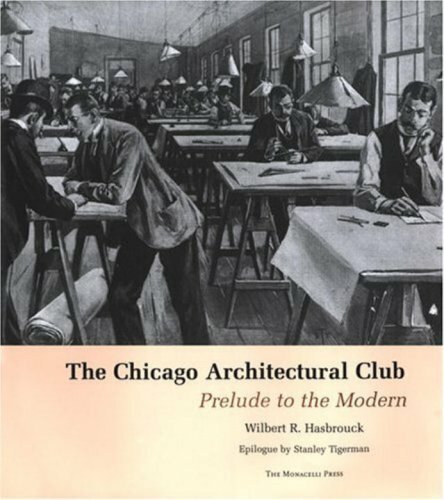 <i>The Chicago Architecture Club: Prelude to the Modern </i>documents the history of these draftsmen, the organization they founded, and its role in shaping architectural education and modern architectural practice.<br /><br /> Founded in 1885, when architecture was an emerging profession and formal architectural education was in its infancy, the Club provided a setting where aspiring draftsmen could develop their skills by creating a professional network and participating in a lively program of lectures, design competitions, and social events. Wilbert R. Hasbrouck documents the personalities and politics of this impressive group, offering an in-depth look at the lesser-known men often largely responsible for the designs credited to their more famous employers. This comprehensive volume includes hundreds of drawings and photographs depicting a wide range of buildings that laid the groundwork for a uniquely American modern architecture. Wilbert R. Hasbrouck, FAIA, has been a practicing architect in Chicago, specializing in historic renovation, for more than forty years.